Michele Storms of the Design Team shared this beautiful goddess creation today. I love the soft subtle color palette she used, and the little pink heart she added. "today a friend of mine, a breast cancer survivor, is having breast reconstruction surgery. i sent her this card with my good wishes. i used a vintage image of venus in her full frontal glory, if you will, using the pinks associated with breast cancer. 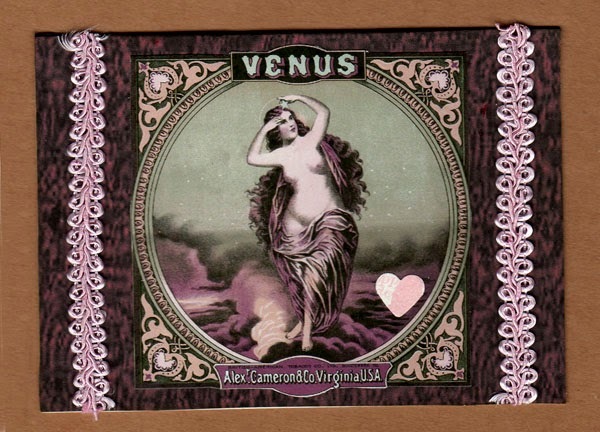 the venus vintage image is from the lunagirl "mighty aphrodite" collage sheet and the background paper was also created by karen at lunagirl. i added ribbon and a punched heart." Venus is a goddess of love and beauty, and through Michele's art also a bringer of healing! Thanks so much to Michele for sharing this! Wow...what a beautiful card Michele. Great goddess image and colors. Love the added trim. I hope all goes well for your friend.